In 2009 I reported from Puglia, the southerly region that forms the 'heel' of Italy's boot-shaped outline, where I had spent a week judging wines at the Radici Festival. The festival puts the focus on native grapes, and I was honoured to be invited back to judge at the Radici competition again this year, spending three days in Puglia judging wines made from varieties including Negroamaro, Nero di Troia and Bombino. Information on the Festival, as well as a full list of this year's winning wines, can be found on the Radici Festival website. It is fair to say that the most serious and dedicated producers would never dream of re-naming their native grape as Zinfandel: they are immensely proud of Primitivo, and perfectly willing to let it fight its own corner. On this visit, I took in three of Primitivo's most passionate advocates, but in three very different operations. Each is determined to save the extraordinary bank of old-vine Primitivo that has been disappearing fast in Puglia. These vines, many 50 years old and more, are trained in the Alberelli system: free-standing bush vines that develop a hardy, drought-resistant character, but which are much harder to work than wire-trained vines. Right, the 60-year-old Alberelli vines at Morella.I also found time to visit Manduria, stronghold of another of Puglia's most important indigenous grapes, Primitivo. Though rarely planted outside the region's boundaries, Primitivo is the best known of all of Puglia's varieties, because of its close genetic ties to California's Zinfandel. This discovery by The University of California a decade ago led to a flurry of excitement, and even to some producers in Puglia applying - successfully - to be allowed to label their wines as 'Zinfandel'. Lisa Gilbee is not your typical Pugliese winemaker. An Australian citizen, Lisa trained at Roseworthy as a winemaker and worked for Capel Vale in Margaret River before setting off to Italy, where she travelled and worked in various regions. Ending up in Puglia, she fell in love not once, but twice. Her first love was Gaetano Morella, son of a vineyard-owning family, and her second was the old bush vine Primitivo which at that time disappeared into tankers bound for anonymous blending. "It was criminal," says Lisa.Today Lisa, Gaetano and their two small kids blend their business (Gaetano looks after the vineyards) with an environmentally-conscious lifestyle. "We treat it like a really large hobby that is also our passion," Lisa tells me, "so we can take our time and make decisions that suit us." One decision they have followed from the outset is to farm organically, and latterly, Biodynamically. "My vines might look uncared for," says Lisa, "but that's part of the philosophy." She goes on to speak of the incredulity expressed by the young winemakers from Australia who come to work with her most vintages, when faced with these straggling, wild looking vines.Morella's first vintage was 2001, with a parcel of 70-year-old Primitivo, but since then they have purchased other small parcels. The couple have also planted new vineyards, but with other varieties including Fiano, not Primitivo. Lisa says that if they want more Primitivo she will only ever buy old bush vine plots, not plant. Clearly preservation of this wonderful material lies at the heart of the Morella philosophy. Delightful spice and smokiness here again, and a definite impression of dusty, cedary character. The fruit has beautiful definition, and the balance is lovely: tannins seem very fine, and there's a delicious finesse and harmony here. Drinking beautifully. 93/100. This was my second visit to see the excellent 'boutique' operation at Attanasio, though last time had been to their immaculate little cellar in the centre of the city of Manduria. Here, I met up again with Luca Attanasio in a Primitivo vineyard first planted by his family in the 1920s. Luca (pictured) is in charge of vineyards and cellars, whilst his brother Alessandro looks after administration. Their father, Guiseppe, still works in the vineyard at the age of 74.I asked Luca about gaps in the free-flowing, but dense formation of bush vines, and he explains how in the 1960s people tended to replace dead bush vines with French hybrids that were easier to grow and yielded much higher quantities of fruit. Attanasio (and Morella) have simply removed these for now as they did not want them in their ferment. Like many others, the Attanasios used to sell their grapes to the local co-op, but about 10 years ago they decided to make wine. They are now concentrated on making a small production from just five hectares of these old Primitivo vines. Like Morella, they have also started to farm organically, and whilst Luca says he may try Biodynamic farming in the future, he fears would be particularly difficult and expensive in this tangle of unstructured, closely-spaced vines where everything must be done by hand. Quite gamy and earthy, with a cedary quality and a lift of floral perfume. The palate has an earthy, bloody richness too, that super-sweet fruit dominates still, the smooth tannins and the infilling, only gently cedary oak adding layers to the finish, which is brightly focused through the crisp cherryish acidity. 92/100. As a complete contrast to the two small, family-owned and run estates of Morella and Attanasio, my last visit in Manduria was to the large and very progressive cooperative cellars of San Marzano, whose flagship Primitivo wine 'Sessant'Anni' picked up a top award in the Primitivo category of the 2010 Radici competition.The Cantine San Marzano was founded in 1962, with its cellars geographically in the centre of Manduria. It is composed of 1,200 growers, and the modern, very well-equipped Cantine shares the same mission as Morella and Attanasio to preserve and celebrate the old bush vine Primitivo in the area. To that end they are trying to buy up old bush vine plots as they come on the market.The Cantine's director Mauro Di Maggio (left, pictured deep in the subterranean cellars) told me they are also investing heavily in trying to produce truly crisp, refreshing white wine styles too, because the Salento peninsula is not known for this style, but he believes is it possible, particularly with the Minutolo grape. Aleatico is believed to be a mutation of Muscat. Made from dried grapes, this has a hugely distinctive nose with floral, jasmine-like fragrance and a certain geranium leaf-like green quality. Some fine cherry fruit beneath. On the palate this has delightful sweetness, the bright, soft cherry fruit flooding the palate, with a certain elegance to the tannins and a long, nicely balanced finish with good freshness. Delicious. 90/100. Cari lettori di questo blog, vi saluto e prendo congedo per qualche giorno. Per l’ennesima volta (è la quinta o sesta quest’anno) me ne scendo nell’amatissima terra di Puglia, alla volta diAltamura e dintorni, per partecipare ad una nuova iniziativa organizzata dal vulcanico Nicola Campanile, il deus ex machina della manifestazione Radici, Festival dei vitigni autoctoni. L’occasione è la partecipazione, coinvolto nell’ideazione e organizzazione, a quella che Nicola ha voluto battezzare “Radici Wines Experience – Vini, cibi e paesaggi di Puglia e dintorni”. L’inglese questa volta è di prammatica, perché si tratta di un evento, che si snoderà dal 19 al 22 novembre, “che si propone principalmente di stabilire relazioni commerciali e culturali con nove wine-buyer e cinque wine-writer provenienti da America, Danimarca e Polonia e di continuare a diffondere voglia di Puglia in quei mercati alla ricerca di destinazioni autentiche ed emozionanti”. Cosa faremo in questi giorni? Il 19 ed il 20 abbiamo previsto una serie di incontri B2B, ovvero Business to Business, tra una quarantina di produttori pugliesi, provenienti dalle diverse aree di produzione, ed i buyer ed i giornalisti stranieri che abbiamo invitato. Il giorno 19 sarà dedicato alle aziende del Primitivo e dell’Area Salento. Il giorno 20 novembre sarà la volta delle aziende del centro Puglia, di tutta l’area Nord e del Vulture. Il giorno 21 sarà invece dedicato ad una serie di visite e degustazioni ad alcune significative aziende dell’area di Gravina e Castel del Monte (splendido castello di Federico II che non mancheremo di andare a visitare), visto che in questa occasione rimarremo nella zona del nord barese, ad Altamura. Ospitati in una bellissima location, da me già sperimentata quest’estate quando passai tre giorni in compagnia dell’amico e collega Vincenzo Rizzi, a degustare nuovamente, per la realizzazione della guida di Radici, i circa 170 vini pugliesi (più una serie di Aglianico del Vulture) partecipanti all’edizione 2010 di Radici. Sto parlando della bellissima Masseria San Giovanni – I luoghi di Pitti. Masseria che sarà lo scenario, lunedì 22 novembre, a partire dalle 15.45, di una serie di momenti importanti dedicati ai vini vincitori del Premio Radici 2010, alla presentazione delle tre guide enogastronomiche di Puglia e l’anteprima del nuovo evento Radici del Sud 2011. Per il primo momento in programma e per tutto lo sviluppo della giornata mi raggiungerà l’amico e collega Luciano Pignataro, responsabile dell’omonimo seguitissimo wine blog, per condurre insieme, dalle 16, una degustazione verticale comparativa di due grandi vitigni del Sud, il Negroamaro e l’Aglianico. Io proporrò tre annate, 1999, 2000 e 2001, di uno dei vini simbolo della Puglia del vino, ilPatriglione dell’indimenticabile Cosimo Taurino, mentre Luciano ci proporrà sempre 1999, 2000 e 2001 del Taurasi di Contrade di Taurasi. In contemporanea, Nicola Campanile, presidente dell’associazione Propapilla, illustrerà, insieme agli altri curatori Pizzaviaggiando – guida alle pizzerie di Puglia, alla sua prima edizione. Alle ore 17,00 sarà la volta di Dolceguida – percorsi enogastronomici di Puglia e dintorni. Nicola Campanile e Vincenzo Rizzi, che ne sono i curatori, illustreranno i tratti innovativi dell’ottava edizione della guida bilingue che ci accompagna alla scoperta delle realtà più autentiche ed accoglienti del mondo della ristorazione pugliese. Alle ore 18,30 ci sarà la presentazione di Radici Wines – guide on Apulia wines for expert and wine lovers, ideata e curata da Nicola Campanile, quest’anno insieme a Franco Ziliani e Vincenzo Rizzi. Sono previsti gli interventi del Presidente nazionale dell’Associzione Donne del Vino Elena Martusciello, dell’assessore regionale pugliese alla Politiche Agricole Dario Stefàno, e di giornalisti del calibro di Kerin O’Keefe, Charles Scicolone e Gregory Dal Piaz (Usa), Marek Bienczyk (Polonia) e di tutto il gruppo dei wine buyers stranieri per la presentazione del nuovo festival dei vitigni autoctoni Radici del Sud – il concorso degli autoctoni esteso all’intero Sud della penisola. Progetto ambizioso ma fortemente condiviso e partecipato da numerosi e autorevoli partners istituzionali e pronti a scommettere sul successo dell’iniziativa. 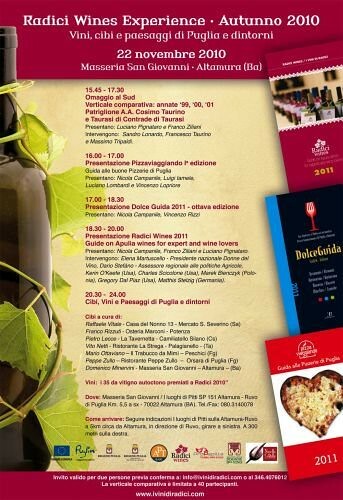 Dalle 20,00 si darà inizio all’assaggio dei 35 vini pugliesi da vitigno autoctono risultati vincitori a Radici 2010 tra i vini 178 in concorso e al ricco evento finale, a cura di sette prestigiosi chef di Puglia, Calabria, Campania e Basilicata: Mario Ottaviano, Trabucco di Peschici (Fg), Peppe Zullo Orsara di Puglia (Fg), Vito Netti Ristorante La Strega di Palagianello (Ta), Domenico Minervini Masseria San Giovanni, Franco Rizzuti Osteria Marconi di Potenza, Pietro Lecce Tavernetta di Camiliatello Silano (Cs) e Raffaele Vitale Casa del Nonno 13 di Mercato San Severino (Sa). Ciascuno di loro realizzerà, nei suggestivi saloni di Masseria San Giovanni dove infatti saranno allestite sette aree ristorante, una portata a base di uno tra i prodotti più rappresentativi del territorio di pertinenza servita in abbinamento con quello che più si addice dei 35 vini premiati. I prodotti, inoltre, saranno esposti al pubblico in un’area apposita in modo da poterne raccontare le caratteristiche e i riferimenti alla loro terra d’origine. Una Puglia, come ama dire Nicola Campanile, “con tanta voglia di cooperare insieme ad altri territori che come lei racchiudono e intendono conservare preziosi patrimoni materiali e culturali, per una affermazione ancora più incisiva del brand “SUD”. Dopo i filmati anche scherzosi cerchiamo di mettere qualche punto fermo sull’edizione 2010 di Radici. La manifestazione oramai è rodata ed il format è sicuramente giusto: due giurie (giornalisti da tutto il mondo e esperti locali), metodo di valutazione chiaro, tempi giusti per gli assaggi ed anche per rilassarsi. Il tutto condito da visite in cantina e da un convegno finale che non è mai la solita carrellata di frasi fatte ma anche quest’anno ha avuto un andamento positivamente nervoso e per niente scontato. Vediamo di dare un giudizio alle varie parti della manifestazione. Come detto oramai rodata e pronta a rispondere alle più svariate emergenze. Quasi perfetto il servizio vini. Speriamo che il gruppo attorno a cui si è creata l’idea di Radici, rimanga unito e coeso. l’idea delle due giurie è assolutamente positiva, specie se i due gruppi non vengono definiti di “giornalisti” e di “appassionati” ma “esperti di vino, anche pugliese” e esperti di vino pugliese. Sotto questa dizione crediamo possa crescere Radici nei prossimi anni. Questo porterà ad avere due giurie di eguale valore ed a non considerare il premi conferito dagli “appassionati” di serie B, perché non lo è. In realtà si tratta forse di quello che alle aziende maggiormente concentrate sul mercato locale interessa di più, perché il ristoratore che apprezza un vino, come torna a casa lo compra. Se questo vi sembra poco…. Comunque il meccanismo collegiale funziona in entrambe le giurie e giudizi diversi stanno nella logica delle cose e del mercato. Raramente ho passato tre giorni di lavoro in un posto tanto bello ed accogliente. Il Relais Melograno è un posto meraviglioso e trovare di meglio è difficile. Detto fino allo sfinimento: la Puglia non è terra da bianchi ma alni Minutolo ci fanno pensare che potrebbe anche esserlo, specie con le moderne tecniche di vinificazione. Il problema è che di Minutolo (o Fiano Minutolo) se ne sente quasi di più negli altri vini che nel Minutolo vinificato in purezza. Credo stia succedendo quello cheè successo anche da latre parti in altri periodi. Un uva che si scopre adatta al territorio ed anche di moda, prima di arrivare a soglie significative di ettari, viene utiilzzata come “pepe e sale” per tutti i vini, dandogli così una marca “generale” che serve più a coprire eventuali difetti o carenze che a dare carattere. Così è accaduto, per esemipo, in Abruzzo per il Trebbiano, prima con lo Chardonnay ed ora con il Pecorino. Ovviamente il consiglio è di non cadere in questa trappola, anche se capisco come la voglia di bruciare tappe e presentare prodotti migliori sia tanta. Il bombino nero è un buon vitigno per fare rosati ma il Negroamaro è meglio! Questo è in sintesi il discorso. I rosati del Salento sono apparsi più omogenei, più riconoscibili, più apprezzabili dei cugini poco a nord. Questo però non deve essere un viatico liberatorio. Se la puglia vuole rimanere la terra dei Rosati italiani deve fare molto di più, perché la media uscita dagli assaggi non era certo da leccarsi i baffi. Bisognerà rischiare di fare più VINI rosati che rosati da salasso. Più profumi e strutture che riassunti enologici, anche piacevoli. Rispetto allo scorso anno è uscito molto migliorato dagli assaggi, ma anche molto trasformato rispetto a quello che , almeno io, avevo in testa. Se il Nero di Troia è un vino con tannini importanti e ruvidi, strutture imponenti e profumi non certo da vitigno bordolese, molti di quelli assaggiati provenivano (almeno in parte) da altre varietà. Visto che comunque sono risultati molto piacevoli ed in conseguenza premiati, si dovrebbe dedurre che la strada intrapresa sia quella giusta. Continuando su questa via forse Radici dovrebbe chiamarsi “Festival dei vini autoctoni con dentro altre uve” e forse tutti i discorsi fatti sull’unicità di quest’uva dovrebbero essere buttati al macero. Forse…. Sta di fatto che quei 4-5 produttori che ancora insistono nel vinificarlo in purezza dovrebbero essere premiati, se non altro per la coerenza. Senza infamia e senza lode il Negroamaro continua a dare buoni risultati, senza picchi. Bisogna anche dire che alcuni dei vini presentati non erano proprio il “Top” di gamma e quindi questo vitigno merita una fiducia superiore rispetto all’esito degli assaggi, che peraltro hanno rilevato, almeno leggendo le mie note un numero piuttosto ampio di vini ( e siamo nel 2010, in piena recessione “parkettistica”) afflitti dalla sindrome di San Giuseppe, alias morbo del falegname, alias uso sbagliato (e/o eccessivo) del legno. Vorrei quindi affermare con forza che per fare dei Negroamaro moderni non occorre semplicemente schiaffarli in legno piccolo, ma iniziare un lavoro diverso dalla vigna per portare in cantina uve che, una volta vino ( se proprio si vuole), potranno maturare in legno piccolo. Qui sta, almeno per me, il contendere. Mi aspettavo, specie dai Primitivo di Gioia del Colle conferme ai risultati eclatanti degli scorsi anni ma questi non sono venuti. Spero dipenda da fattori esterni, dall’estrema giovinezza dei vini e non da una stasi produttiva. La mia fiducia in questo vitigno, anche per la zona di Manduria, rimane invariato. Del resto siamo di fronte ad un vitigno che riesce ancora ad esprimersi con un carattere preciso, che sembra resistere bene all’uso del legno e risulta talmente versatile da dare ottimi risultati sia in vini giovani che in prodotti più importanti e con qualche anno di maturazione alle spalle. Bel risultato generale: tannini austeri e veraci, profondità, grinta, anche eleganza. Si conferma (se ce ne fosse stato bisogno) un grande vitigno. Peccato solo che i campioni non fossero stati di più e che il nostro /mio giudizio non sia stato maggiormente avvalorato. Peccato anche che i vini provenissero tutti dal Vulture: un buon numero di Taurasi avrebbe reso la cosa molto più interessante. In definitiva un panorama con luci e qualche ombra enologica che torneremo a testare (fuori da Radici) quanto prima. Si sta muovendo qualcosa nel paese del sole: Se ieri la puglia stava ancora esportando vino economico in tutto il mondo oggi è finalmente alla ricerca dell’alta qualità. Nicola Campanile attraversa con la sua jeep le strade sterrate e con dossi della Valle d’ Itria. In questo altopiano i produttori di vino di alta qualità lottano per un sostegno da parte delle istituzioni, perchè bisogna cambiare qualcosa in questa regione dove i giovani contadini guadagnano 30-40 centesimi di euro per kg di uva prodotta. Campanile, autore di una guida sul vino, un event manager e uno esperto nel campo del turismo enogastronomico ci presenta 3 viticultori della regione: Pasquale Carparelli Mr. “Minutolo” che prospetta il futuro. Se in futuro non si punterà molto piu sulla qualità e sulla tipicità si rischia di perdere tutte le sfide con i nuovi mercati mondiali, dice Campanile e preme sull’accelleratore. Il fango delle pozzanghere schizza su tutti i lati, il viaggio attraverso la valle d’Itria diventa un avventura. Persino in Puglia, il paese della primavera eterna come la descrisse Orazio ogni tanto piove, nevica e c’ è la tramontana. Il nome della regione dicono gli uomini del postoprovviene dalla parola latina a-pluvia (senza pioggia). Con 100.000 ettari la Puglia costituisce un ottavo della superficie vinicola italiana e con 7 millioni di ettolitri di vino costituisce il 13 per cento della produzione vinicola del paese. Da sempre in puglia cresce una grande varieta di vitigni che se coltivati in piccole quantità e più vocati alla qualità sono in grado di presentare un potenziale da vini di grande livello. Nel Nord fino a Bari si possono scoprire il Nero di Troia e il Bombino Nero che non sono state apprezzati per lungo tempo a causa della loro acidità. La conoscenza che l’ allevamento a cordone abbia degli esiti positivi sulla qualita dell uva, motiva la nuva generazione di agricoltori a produrre sempre piu vini di specie pure e portare sul mercato vini di classe. Cosi nascono da Bari, il capoluogo della Puglia, attraverso le pianure del Salento tra l’Adriatico e il mar Ionio, dei rossi moderni e dei rosè molto fruttati da varietà come Primitivo, Negroamaro, Uva di Troia e Malvasia. Anche i vini bianchi reggono il confronto: il Fiano, un clone della varietà Avellino, Greco, Verdeca, Malvasia Bianca, Bianco d Alessano e il famoso vino dolce Moscato di Trani. Altrettanto variegati si presentano i terreni. Facendo l’occhiolino, la guida turistica fa riferimento al tricolore: verde per gli ulivi, bianco per il calcare e rosso per la terra rossa. Gli abitanti della Valle d’Itria a ovest di Fasano sono molto fieri di aver scoperto una nuova specie chiamata Minutolo. Questa specie viene coltivata soltanto in questa regione e ne scaturisce un vino con aroma discreto, minerale, speziato e elegante. La coltivazione della vigna richiede molta esperienza e competenza cosi sostiene Pasquale Carpanelli, padre del Minutolo. Attraverso la sua passione per il vino, alla fine degli anni 90 scoprì questo vitigno che ricorda il Fiano e assomiglia molto al Gewuerztraminer. E’ arrivato a coltivare ettari e quest’ anno la specie del Minutolo verrà ufficialmente annoverata come tale anche nei libri di specie. Filippo Cassano, viticultore, ha una filosofia molto chiara che stupisce ed è molto coraggiosa: la produzione di vino in botti di legno pregiudica il colore e sottrae al vino gli aromi fruttati. Per questo motivo nella cantina biologica di 30 ettari fondata solo nel 2000 non si trovano nè botti di rovere nè botti di barrique. Per la produzione del suo vino il giovane viticoltore usa solo ed esclusivamente serbatoi di cromo e acciaio. Con questa novità Cassano è un vero e proprio rivoluzionario della produzione del primitivo che rappresenta il 70% della sua produzione. I risultati dell’ anno 2009 sembrano promettere bene. La famiglia di Pasquale Petrera produce vino a Fatalone in agro Gioia del Colle da 5 generazioni. Insieme a suo padre ha deciso di puntare sulla produzione tradizionale e biologica del vino. Anche lui sa che solo la qualità in termini produttivi porta qualità nella bottiglia. I vini di Petrera, sopratutto Primitivo e Greco, sono prodotti tradizionalmente anche se vengono utilizzati dei metodi molto moderni. Le vigne sono esposte esattamente da nord a sud in modo da garantire l’ottimale irradiazione solare e aerazione. Ghiaia di pietra calcarea protegge il suolo da un’irradiazione solare troppo forte e una volta all’anno viene messo del letame di cavallo nel suolo. Nella cantina l’enologo fa maturare il vino con musica classica. Non conosce ancora l’effetto esatto della musica sul vino però il risultato è un aroma minerale, fruttato. La puglia fa parte delle zone vincole piu antiche del mondo. Gia i Fenici e i Greci coltivarono vino in questa regione. Al contrario delle altre regioni Italiane abbastanze montuase o collinari la puglia ha grandi pianure e altopiani. Aromi conosciuti in questa regione: fiori di arancio, fichi, frutti di bosco, mandorle verdi, miele, balsamico e anche cannella e liquirizia. Degustazioni guidate e mirate alla distribuzione di qualità Bruxelles, 23 marzo 2010. La sede della Regione Puglia, in Rue du Trone, 62, dalla tarda mattinata, ha cominciato a trasformarsi in un brulicante centro di interesse. Come da programma, infatti, alle ore 14,00 sono partite le degustazioni dei vini di Puglia selezionati fra quelli che hanno partecipato all'ultima edizione di Radici - festival dei vini da vitigni autoctoni. I destinatari privilegiati di questo evento sono noti ristoratori, sia cittadini che provenienti da tutto il Belgio, buyer della distribuzione specializzata, giornalisti di settore, esperti ed opinion maker del buon bere, italiani a Bruxelles ed Apulia lovers. “A queste latitudini e con un confinante come la Francia, terra e maestra del miglior bere, il buon vino si fa apprezzare e il vino pugliese, fatto con coscienza e sapienza, aspetta solo di essere valutato e conosciuto, senza temere confronti”, dice Nicola Campanile, coordinatore dell'evento, e continua: “I nostri vini, i vitigni autoctoni di Puglia, sanno riservare grandi sorprese a chi desidera degustarli, aprire il proprio sentire, senza preconcetti, alle sensazioni che sanno suscitare: visive, olfattive, organolettiche, evocative.” Compito delle istituzioni è quello di sostenere le produzioni e la cultura del vino e gli amministratori pugliesi ne danno dimostrazione anche attraverso un appropriato calendario di eventi miranti a creare un sano dialogo fra l'offerta e la domanda. Infatti, all'evento sono presenti circa una quindicina di produttori che sono stati impegnati, durante il pomeriggio, per incontrare e stabilire accordi con i selezionati partecipanti. Utile supporto e strumento di orientamento e consultazione è stato il volume “ Radici Wines – Guide to Apulia wines for experts and wine lovers”che raccoglie le recensioni, curate da tecnici ed appassionati, dei 175 vini che hanno partecipato all'edizione di Radici 2009, presentato e consegnato ai presenti prima dell’inizio delle degustazioni. La guida, in italiano ed inglese, è un compendio di notizie e riferimenti certi su produzioni e aziende ed è stata molto apprezzata ed ambita da tutti. Impeccabili l'accoglienza, l'efficienza del lay-out e i supporti organizzativi, garantiti dalla competente collaborazione del Dott. Casalino, dirigente della sede di Bruxelles della Regione Puglia. Dopo le 18,00 è arrivata una nutrita delegazione di dirigenti parlamentari e appassionati del vino, insieme ad altre personalità cittadine, per una curatissima degustazione di prodotti tipici in abbinamento con i vini autoctoni pugliesi curata interamente da Masseria Barbera di Minervino Murge. Molti italiani residenti a Bruxelles si sono fatti ambasciatori della Puglia con i loro colleghi di altre nazioni in un momento di riuscita convivialità e interessante scambio culturale. Quel che appare evidente, a fine serata, è l'interesse mostrato verso i nostri vini e, ovviamente da intenditori, verso vini di qualità, certamente competitivi anche nella politica dei prezzi, rispetto ad etichette più blasonate, sia italiane che francesi o tedesche. La Puglia ha un suo stile, un carattere fatto di tante preziose sfaccettature, di tanti territori e culture dalle radici profonde che si leggono chiaramente attraverso i suoi vini, e sa farsi amare e desiderare. Produttori presenti: Gregory Perrucci – Racemi s.r.l. Nadia Tarantini – Azienda agricola Tarantini Marika Grasso – Azienda agricola La Marchesa Rita Baldassarre – Emera / Masseria del Sigillo Nicola Ferri – Cantine Ferri Filippo Cassano – Polvanera Natale del Prete –Azienda Natale del Prete Pasquale Petrera – Azienda Agricola Fatalone Federico Cirillo Farrusi – Torre Quarto Cantine Annalisa Conserva - Santa Maria del Morige Cantine Menhir Facccini Dominic – Masseria l’Astore D’Alfonso del Sordo Apollonio.